This entry was posted in Army Medical, NUMS and tagged AMC, AMC 2017, AMC 2nd merit list, AMC 2nd merit list 2017, AMC Admission Form, AMC admission form 2017, AMC Admission Test, AMC Admission test 2016, AMC answer key, AMC Application form, AMC BDS Merit list, AMC Biology MCQs, AMC Biology MCQs with answer, AMC Biology MCQs with explanation, AMC Chemistry MCQs, AMC Chemistry MCQs with answers, AMC Chemistry MCQs with solution, AMC Entry Test, AMC Fifth Merit List, AMC Foreign seats, AMC Foreign seats merit list, AMC Foreign seats merit list 2017, AMC MBBS, AMC MBBS Merit List, AMC MCQs, AMC MCQs with answers, AMC MCQs with solution, AMC Past Papers, AMC Physics MCQs, AMC Physics MCQs with answer, AMC second merit list, AMC second merit list 2017, AMC Third Merit List 2017, AMC Third Merit List for BDS, answers key for NUMS, How to Apply for Army Medical College (AMC), How to fill application Form for AMC, How to fill application Form for NUMS, how to get AMC roll number slip, how to get NUMS roll number slip, How to prepare for AMC admission test, How to prepare for NUMS admission test, NTS NUMS, NTS NUMS Admission, NUMS, NUMS 2nd merit list, NUMS Admission, NUMS admission 2017, NUMS Admission form, NUMS admission test 2016, NUMS admission test 2017, NUMS BDS, NUMS BDS Admission, NUMS BDS Admission 2017, NUMS BDS Admissions, NUMS BDS Admissions 2017, NUMS BDS Merit list, NUMS Biology MCQs, NUMS Biology MCQs with answers, NUMS Biology MCQs with solution, NUMS Chemistry MCQs, NUMS Chemistry MCQs with answers, NUMS Chemistry MCQs with solution, NUMS English MCQ's, NUMS English MCQ's with answers, NUMS Entry Test, nums entry test preparation, NUMS Fifth Merit List 2017, NUMS Foreign seats merit list, NUMS MBBS, NUMS MBBS Admission, NUMS MBBS Admission 2017, nums merit list, NUMS MOCK test, NUMS Pastpapers, NUMS Physics MCQs, NUMS Physics MCQs with answers, NUMS Result, NUMS roll number slip 2017, NUMS solved papers, nums test, NUMS test format, nums test result 2017 on December 6, 2017 by Pakprep.com Admin. National University of Medical Science (NUMS) has announced initial merit with merit positions for Army Medical College (AMC) Rawalpindi. Candidates Army Medical College (AMC) can check merit positions and if they notice any error in merit number or any other field they need to submit error before 18th October (1600 hours) after that no change or claim will be acceptable. Final Merit list for AMC will be announced on 19th October 2017. Pakprep.com is the best source for the preparation of Medical Colleges, Engineering Universities, NTS, Army, PAF test. Our MCQ’s data bank contains more than 15,000+ fully explained MCQ’s with answers and solutions which help students to get good score in test. To start your preparation Click Here. How to check merit position for NUMS. 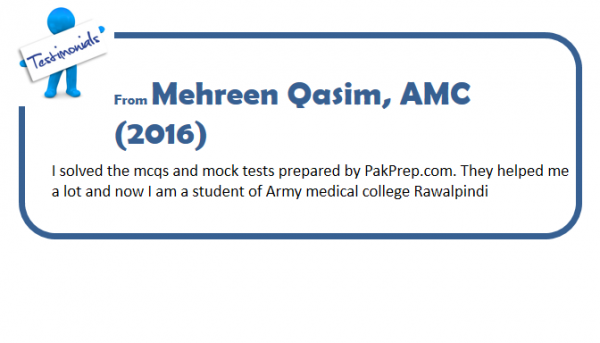 This entry was posted in Army Medical, NUMS and tagged AMC, AMC 2017, AMC Admission Form, AMC admission form 2017, AMC Admission Test, AMC Admission test 2016, AMC answer key, AMC Application form, AMC Biology MCQs, AMC Biology MCQs with answer, AMC Biology MCQs with answers, AMC Biology MCQs with explanation, AMC Biology MCQs with solution, AMC Chemistry MCQs with explanation, AMC Entry Test, AMC MBBS, AMC MCQs, AMC MCQs with answer, AMC Merit list, AMC Past Papers, AMC Physics MCQs, AMC Physics MCQs with answer, answers key for AMC, answers key for NUMS, BDS, BDS Admissions, bds merit list, BDS test, How to Apply for Army Medical College (AMC), How to fill application Form for AMC, How to fill application Form for NUMS, how to get NUMS roll number slip, How to prepare for AMC admission test, How to prepare for NUMS admission test, mbbs, MBBS 2016, MBBS 2017, MBBS admission, MBBS admission 2016, MBBS Admission in Islamabad, MBBS Admission Test, MBBS Admission Test 2017, MBBS in Pakistan, mbbs merit list, MBBS Seats in Punjab, NTS NUMS, NTS NUMS Admission, NTS NUMS Test Answer Key, NTS NUMS Test Answer Key 2017, NUMS, NUMS Admission, NUMS admission 2017, NUMS Admission form, NUMS Admission test, NUMS BDS, NUMS BDS Admission 2017, NUMS Biology MCQs with answer, NUMS Biology MCQs with answers, NUMS Chemistry MCQs, NUMS Chemistry MCQs with answers, NUMS MBBS, NUMS MBBS Admission, NUMS MBBS Merit list, NUMS MBBS Merit list 2016, NUMS MBBS Merit list 2017, NUMS MCQS, NUMS Pastpapers, NUMS roll number, nums test result, nums test result 2017 on October 17, 2017 by Pakprep.com Admin. This entry was posted in Army Medical, NTS, NUMS and tagged AMC answer key, AMC answer key 2017, AMC answer keys, AMC answer keys 2017, AMC Biology MCQs with answer, AMC Biology MCQs with answers, AMC Chemistry MCQs with answer, AMC Chemistry MCQs with answers, Answer key, Answer key of Blue Booklet, Answer key of Blue Booklet 2017, Answer keys, Answer keys of Blue Booklet, Answer keys of Blue Booklet 2017, answers key for AMC, answers key for NTS, answers key for NUMS, Blue Booklet Answer, Blue Booklet Answer key, Blue Booklet Answer key 2017, Blue Booklet Answer keys, Blue Booklet Answer keys 2017, Green Booklet Answer key, Green Booklet Answer key 2017, Green Booklet Answer keys, Green Booklet Answer keys 2017, NTS Blue Booklet Answer key 2017, NTS Blue Booklet Answer keys, NTS Blue Booklet Answer keys 2017, NTs Green Booklet Answer, NTS Green Booklet Answer key, NTS Green Booklet Answer key 2017, NTS Green Booklet Answer keys, NTS Green Booklet Answer keys 2017, NTS NUMS, NTS NUMS Admission, NTS NUMS Test Answer Key, NTS NUMS Test Answer Key 2017, NTS NUMS Test Answer Key s, NTS NUMS Test Answer Keys 2017, NUMS Blue Booklet answer, NUMS Blue Booklet answer key, NUMS Blue Booklet answer key 2017, NUMS Blue Booklet answer keys, NUMS Blue Booklet answer keys 2017, NUMS Blue Booklet answers, NUMS Green Booklet answer, NUMS Green Booklet answer key, NUMS Green Booklet answer key 2017, NUMS Green Booklet answer keys, NUMS Green Booklet answer keys 2017, NUMS Green Booklet answers, NUMS NTS Blue Booklet answer, NUMS NTS Green Booklet answer on August 28, 2017 by Pakprep.com Admin.